Any South Indian would love to try a recipe if its titled as “Saravana Bhavan Hotel Style”. I am no exception to this. 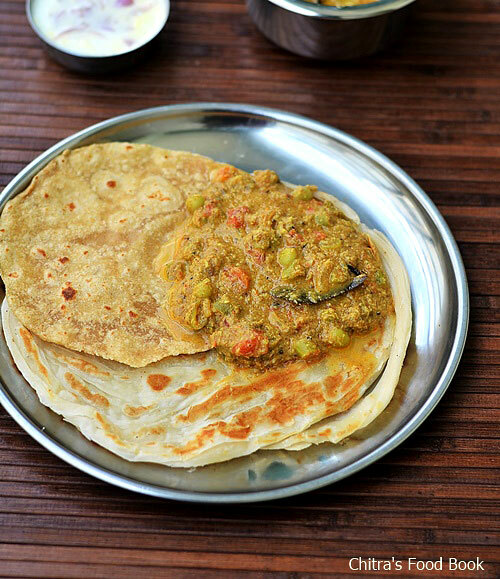 I have tasted Saravana Bhavan hotel vegetable kurma for parotta in Chennai before marriage. I love try all the recipes of it that I come across in my fellow bloggers blog. 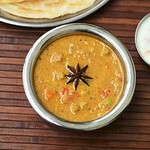 Recently I saw this Saravana bhavan hotel style mixed vegetable kurma recipe for parotta and chapathi in Amudha’s blog. I tried it for Sendhil’s lunch box to pack with roti by following an easy one pot method. It smelt and tasted very similar to most of the hotel style vegetable kurma. I loved it very much. I packed this kurma and soft Chapathi for his lunch box & I had it with some store bought frozen parotta for my breakfast. It tasted great for both. So you can make this kuruma as a side dish for roti and parotta as well. If you don’t have all the vegetables in hand, just try adding potato,peas and make it as potato kurma. Kids would love this combo. So try this recipe and don’t forget to smell your hands after you finish eating this kurma. It would be awesome !! 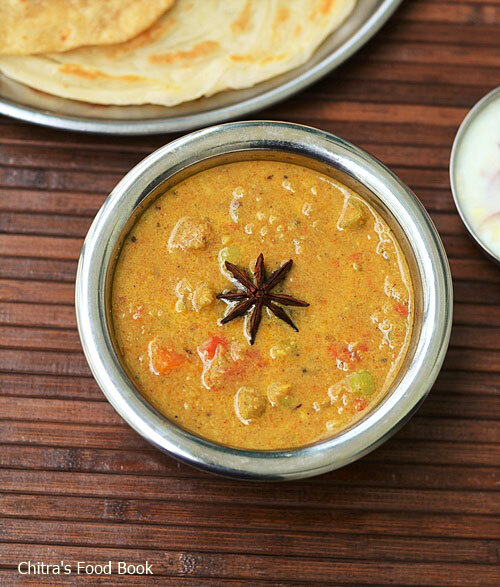 Ok, lets see how to make this most popular, super flavorful Saravana Bhavan Hotel Style mixed vegetable kurma with video and step by step photos and video. Check out my Saravana bhavan hotel white kurma and hotel style coconut chutney recipe too. Also have a look at my collection of 20 kurma varieties for chapathi, poori, idli and dosa. 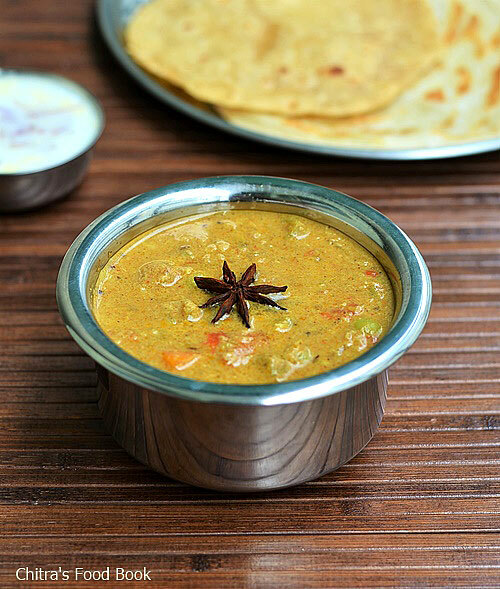 Saravana bhavan hotel style vegetable kurma recipe for Chapathi/Roti and Parotta. Wash and chop the vegetables finely.Chop the onion and tomato.Grind all the ingredients given under “To grind” to a smooth paste adding enough water. Heat a pressure cooker base and add oil + ghee.Saute the bayleaf and black stone flower/Kalpasi.Add cumin seeds,onions , gg paste and saute till it turns transparent n raw smell goes off.Add mint leaves.Then add the tomato pieces and saute until mushy.Add the ground coconut paste,turmeric powder,red chilli powder and Garam masala powder.Add the required salt and saute well till the raw smell of masala vanishes.Do in medium flame. Lastly add the finely chopped vegetables and peas.Mix well and add a 1.5 cups of water. Mix well and add curd. Mix well and pressure cook in low flame for just one whistle. 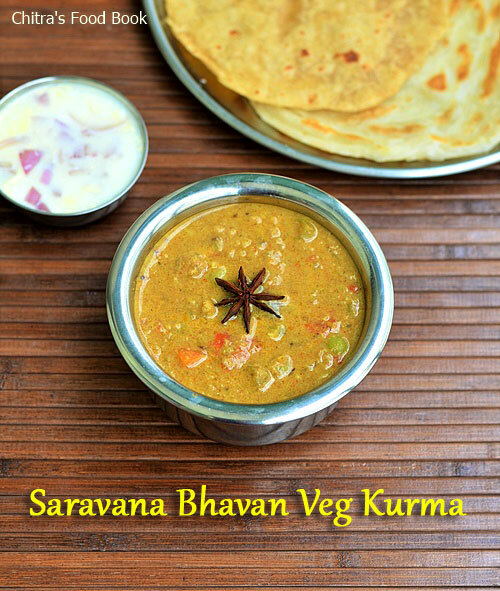 Sarvana bhavan style mixed vegetable kurma is ready to serve !! Enjoy with chapathi or parota.It tasted great with dosa too! NB: As per the actual recipe,vegetables has to be cooked before adding the masala. But I made everything in one shot. Still the taste was good. Grinding part is the highlight of this kurma. So please don’t omit any ingredient from it. No worries if you don’t add khus khus.But the remaining are must. I did not add mint leaves as I din’t have it. Don’t forget to add it if you have them. It adds a nice flavor to this kurma. Adjust the quantity of chillies and red chilli powder based on your taste. I used fresh green peas here. If you are using dried peas, soak it overnight in required water. Some hotel kurma recipes called for using water + milk in equal ratio. But I never use milk as I don't want to mix curd & milk together. So you can try this for variations if you like. Try this yummy Mixed vegetable kurma for roti/Parota.Take the credits from your family members and enjoy !! Brought back sweet memories of Chennai days.. Loved all the dishes of Sarvana Bhavan..
Hai Chithra I tried ur veg.kuruma recipe today. It came very tasty.Thanks for sharing. I tried this recipe yesterday and it was so delicious. Thank you for sharing and keep up the good work. Thanks a lot Aarthi :) Iam so glad ! Hiii Chitra... Today morning I have made this Kuruma... Came out really well.. My little girl usually doesn't like the Kuruma... But she finished her chapathi with the kuruma and ate one more... �� ��. She told me that even it smells good.... Thanks for sharing the recipe. I am so happy to hear this :) Thanks a lot for trying ! I just tried this for lunch today. My vegetable hating daughter ate all of it and asked for a second helping! Thanks so much for sharing this recipe. This recipe is super delicious and quick.enjoyed it thoroughly. Thank you so much for sharing it. Happy to know :) Thanks a lot ! I have made this twice now and it has quickly become a favorite. Thank you for the excellent recipe. "Zero error recipe". Usually for new recipes I reduce the ingredients quantity by half and then prepare the dish. But I was sure when I saw this recipe and made with double quantity and the result is I am not wrong. Excellent recipe! Thank u so much for sharing the recipe.. My hubby was totally happy with my preparation for this kurma.. So I am very happy.. Thanks once again for uR posts.. I m trying one by one.. Whenever i prepare this dish, everybody would love it so much and they would nevet forget to applaud me for this. Can i use blanched almonds instead of cashews ???? Will the flavour be the same ? Thanks a lot for the feedback Archana.I am glad to know this.You can use blanched almonds as the quantity is negligible.It doesn't make any difference :) So go ahead. I will try this recipe and let u know. Thanks for sharing it dear Chitra. Hi...no where you used ginger garlic paste in the recipe. When to use it? Anyways I am ready to cook now. Will add it while sauting onions. Yummy kuruma! It came out very well for the first time itself. First I thought ingredients r the same. What difference does it make? But...wow great. Thank you so much for the recipe.. Kurma turned out great.. I jus added a few drops of lemon juice befor serving.. Helped to bring in a lil tanginess.. Lovely recipe with correct proportions.. Durga. I have tried making Kurma,a number of times. But your recipe was spot on!! :) It came out exactly the way I wanted. Thanks a lot! Thanks for sharing the recipe it's perfect for ghee rice n rotis..in which stage you will add star anise? I dint add..
Hi thanks for the feedback.It should be added in the beginning if u add.But here i used for decoration. Thank you Chitra. Everyone loved thus kurma recipe. All your recipes turn out wonderful. Keep posting. Tried this recipe today, it was super yummy :) Thanks for sharing. I have tried this three times in last two weeks..Today also..yummy delicious tasty recipe.cameout well.My family loved it.Thanks alot. Is it good idea to add both milk and curd to the dish. It tends to create digestive issues. I too never use milk in this recipe. But I have mentioned it just for variation as some people prefer it. You can use only water & curd in this recipe. It will turn out well. Enjoyed both cooking and eating.. thanks for the recipe..